Materials, such as art supplies, can wreck a budget. Ask your instructor if any stores offer student discounts. Sometimes, you need a voucher or coupon from the college; but, generally, your student ID is sufficient. How much can you save? Up to 25 percent on average. Check with other students to see if you can carpool. If you live close to school or on the campus, consider getting a bicycle. Students who attend school during harsh climate seasons, such as Wisconsin in the winter or Arizona in the summer, may need to arrange for alternative transportation when the weather prohibits bike riding. Don’t forget public transportation. Often, companies offer special discounts. For example, New Jersey students can save 25 percent on NJ TRANSIT Monthly Passes and Miami-Dade Transit offers College EASY Ticket discounts for students at most area colleges. Sometimes, students can find savings in unexpected areas. Consider your money management habits. That debit card makes it too easy to spend your hard-earned cash. Switch to writing checks for expenses. The act of writing out the check may make you reconsider extravagant expenses. You can save on checks by skipping the ones the bank offers and using online sources like Checks SuperStore. If you want to know exactly where and when you wrote your checks, get the duplicate check option. Watch for specials, coupon codes, and other discounts when buying items online. With movie and concert costs skyrocketing, many students are choosing other sources of entertainment. Find activities that allow you to split the costs with others, such as camping, renting DVDs, doing scavenger hunts, and more. Take advantage of any student discounts, such as half price zoo entrance, discounted restaurant meals, cheap movie tickets or free popcorn, and more. Looking for an activity that is both fun and beneficial? Consider volunteering. For example, you may spend a day at an animal shelter, working for Habitat for Humanity, helping at a food pantry, building paths for nature parks, or doing other activities. Not only is volunteering a free activity, but often students can gain valuable networking contacts at these events. Saving money while attending college is difficult; but with some careful planning and savvy money management, you can stay within your budget. Changing a few habits, such as writing checks instead of swiping a credit or debit card, can help you watch your expenses. 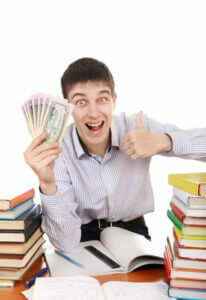 Saving money on the items you buy, including textbooks, supplies, checks, and more, also makes it easier to succeed.